On paper, the Paul Simon and Sting tour might seem an odd combination: two artists from different musical generations and the wildly different background genres of folk and punk power rock. 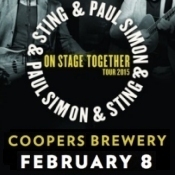 On stage at Cooper's Brewery, however, the "Simon & Sting-funkel" experience made perfect sense: two singer-songwriters whose musical vocabularies have grown to embrace an ever-expanding range of influences, from world music to jazz, roots and classical. This was no ordinary double bill. 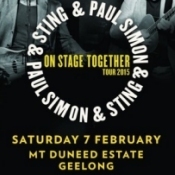 Instead of performing full solo sets of their own material, Simon and Sting wove in and out of each other's repertoire - harmonising on some tracks, alternating phrases on others and even trading complete songs in some instances - to create a wholly unique show. In between, they performed short and then longer solo sets, joining for a couple of duets at each handover. 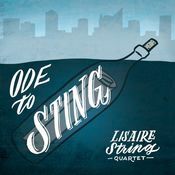 Likewise, the players from their respective, world-class bands mixed, matched and united in various configurations to meet the specific demands of each song, resulting in many magnificent instrumental passages. Opening with both bands on stage, the chemistry between the two frontmen was immediately apparent as they traded lines on Sting's joyous Brand New Day, then harmonised over the thundering tribal rhythms of Simon's The Boy in the Bubble and again swapped phrases on Sting's Fields of Gold. The duo's vocal harmonies were completely different to the more familiar strains of Simon's original partner Art Garfunkel and cast each song in a new light: earthier and more visceral. Sting then cranked up the volume for his first bracket, starting with The Police's So Lonely (complete with tuba solo), leading a big piano and bass jam on When The World is Running Down, throwing a dash of Synchronicity into Seven Days, adding a manic violin solo to the already frenetic Driven to Tears and putting a big brass intro on Walking on the Moon. He was rejoined for Mother and Child Reunion by Simon, who then took his own band through the extra funky chorus and whopping Wurlitzer solo of 50 Ways to Leave Your Lover, got the joint jumping with the classic Graceland and then mellowed the mood with a hauntingly beautiful rendition of Still Crazy After All These Years. Simon even performed a whistling solo on the Latin-flavoured Me and Julio Down by the Schoolyard, before adding his extra-delicate lead vocal to Sting's Fragile, while its author played guitar in tandem with a muted trumpet. Sting, in return, paid tribute to Simon with his solo acoustic guitar version of the inspirational America. For his main set, Sting got the crowd clapping and dancing with Message in A Bottle and gave kudos to his Adelaide born and trained backing vocalist Jo Lawry for her soaring improvisation on Mercury Falling. After playing the fox on End of the Game, he interpolated some very funky bass runs and a lean version of Bill Withers' Ain't No Sunshine into an elongated Roxanne and introduced some Middle Eastern musical spice with Desert Rose. By contrast, Simon kicked off his solo set with the gentle acoustic guitar of perhaps his most poignant tune, The Boxer, then took us into rollicking Cajun zydeco territory of That Was Your Mother which, like the following Obvious Child, was peppered with multiple, comical false endings. Hearts and Bones led into the rolling blues riff of the classic Mystery Train before Simon again got the audience on its feet with two of his biggest 1980s hits, Diamonds on the Soles of Her Shoes and You Can Call Me Al. If anything, Simon's slightly quieter, better balanced sound mix - which allowed the full intricacy of his backing musicians to be heard, rather than just Sting's bass and drums - gave his performance the edge on the night. Sting and Simon reunited for a final bracket, harmonising on Cecilia, alternating lines on Every Breath You Take and then each taking a verse on the epic Bridge Over Troubled Water. They returned sans bands, with just acoustic guitars in hand, for a yearning tribute to the Everly Brothers on When Will I Be Loved? The answer came back right there and then from a thoroughly - and justifiably - infatuated audience.